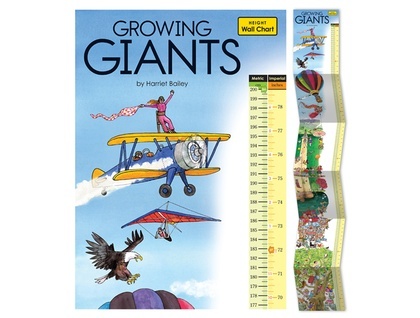 Record your growing giants against an imaginative backdrop of time and place. From the smallest to the tallest – where do you fit in? In this far away land where growing giants visit to be measured up, there’s lots happening to generate questions, spark the imagination and create new stories! The children are brave and fearless, the grown-ups...not so much! 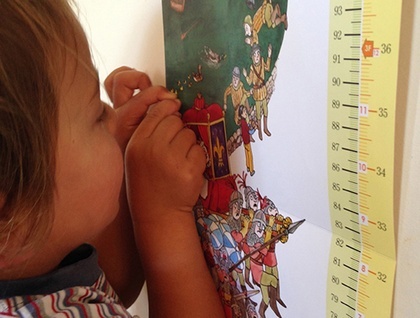 This height chart with metric and imperial measurements can accommodate the whole family. Measures 22.5 cm to 2 meters (8.85 inches to 78.74 inches). The paper is a strong, durable weight. Height marks, name and date can be written on with pencil or biro. Attachment instructions are printed on the chart: Position folded base edge exactly 22.5 cm (width of height chart or 8.85 inches) above floor. Secure with bluetac at base and hang from drawing pin/picture hook using attached tab. 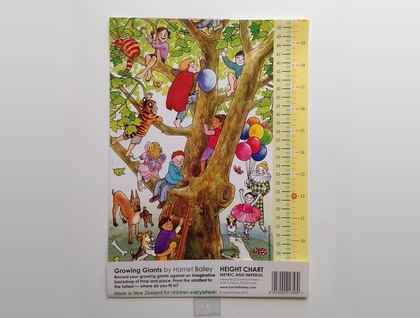 *Or to add weight to wall chart so it hangs, tape up base to make pocket and slot in child-safe object. 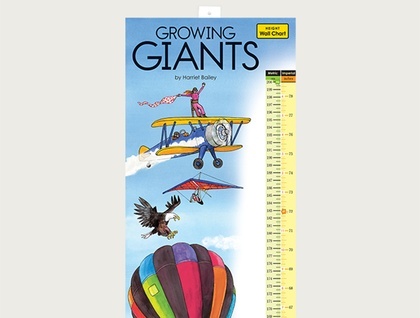 This height wall chart is 22.5 cm x 189 cm and uses total of 22.5 cm x 2 m wall space. The paper is 100% recycled and is commercially printed in New Zealand using vegetable-based inks. Contact forchildren to enquire about payment or shipping options. Made in New Zealand for children everywhere!